Enable Desktop notifications to recieve notifications on the unread emails as and when they recieve. A typical notification display will be as shown below. 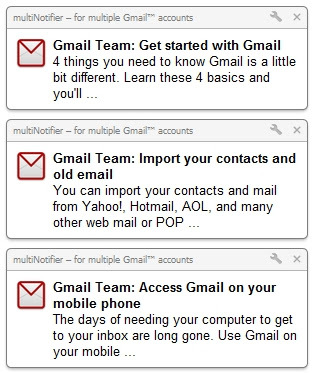 The maximum number of notification per email account is currently limited to 5. Also note that whenever the account details are updated using the options page, the notification history count will get reset for all the configured accounts. Click on this individual email notification, to login to the respective Gmail account and to view the full content of the email. You can also configure the notification frequency and the sound to be played for desktop alerts. Here is a video demonstration of the complete setup. If you have any feedback or suggestions, let us know using the options mentioned here.